‘The Rings of Darelius’ came out of a desire to see if I could write something outside of my comfort zone – crime thrillers. A sci-fi saga in four parts, it is still a thriller, which gave me the start I needed. It began life as a short story of around 5,000 words and then, with a little thought, mushroomed to the 85,000 word novel which has now become available through Lulu.com, me, and – soon- Amazon and the like. Much of the inspiration for the plot comes out of my passion for science fiction in the form of the writings of Isaac Azimov and Frank Herbert, and the visual effects behind Gene Roddenberry’s ‘Star Trek’ series. 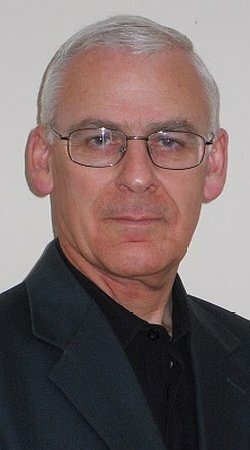 Neal James began writing in 2007 when a series of short stories found favour on a number of international writing sites. Since then, he has released six novels and one anthology. He has appeared in both the national and local press, and has also been a regular at branches of Waterstones and local reading groups and libraries in his home counties of Derbyshire and Nottinghamshire. ‘Day of the Phoenix’, the sequel to ‘A Ticket to Tewkesbury’ has taken him into the realms of politics and the murky waters of espionage, and takes his 2008 novel to its logical conclusion. ‘The Rings of Darelius’ sees him step outside of this comfort zone for the first time. An accountant for over 30 years, that training has given him an insight into much of the background required in the production of his writing so far. He lives in Derbyshire with his wife and family. Find out more about Neal James and all of his writing on his website and on Amazon. And here’s where you can find out more about The Rings of Darelius.